U.S. stock futures are pointing higher for another positive start to the trading day in the U.S. on Thursday, August 11. The Dow Futures are higher at 18499.0 for a gain of 47.00 points. The S&P 500 Futures are higher at 2176.5 for a gain of 3.75 points. The Nasdaq Futures are higher at 4793.25 for a gain of 11.75 points. The Russell Futures are higher at 1224.5 for a gain of 3.20 points. In overnight trading in the Eastern Hemisphere, Japan’s Nikkei 225 is at 16735.12 for a loss of -29.85 points or -0.18 percent. Hong Kong’s Hang Seng Index is at 22580.55 for a gain of 88.12 points or 0.39 percent. China’s Shanghai Composite is at 3002.64 for a loss of -16.11 points or -0.53 percent. India’s S&P BSE Sensex is at 27856.50 for a gain of 81.62 points or 0.29 percent. In Europe, the FTSE 100 Index is at 6847.15 for a loss of -19.27 points or -0.28 percent. Germany’s DAX is at 10712.50 for a gain of 61.61 points or 0.58 percent. France’s CAC 40 is at 4481.65 for a gain of 29.64 points or 0.67 percent. The Stoxx Europe 600 Index is at 345.22 for a gain of 1.24 points or 0.36 percent. Reports on the economic calendar for Thursday include the following: Jobless Claims, Import and Export Prices, the Bloomberg Consumer Comfort Index, the EIA Natural Gas Report, the Fed Balance Sheet and the Money Supply. Stocks appear poised for gains on Thursday however lower oil prices are affecting valuations. A report from the International Energy Agency is also predicting lower demand for oil in 2017 which could continue to cause oil prices to be a trading factor this week. Earnings for the second quarter continue to be an improvement from the first quarter. On Thursday, approximately 150 companies will report earnings. Retail industry earnings reports are currently in the spotlight. The following retail companies will report earnings on Thursday: Macy’s, Kohl’s, Alibaba, Nordstrom and Dillard’s. In the pre-market, stocks trading actively include the following: KLA-Tencor Corp., Transocean Ltd., First Solar Inc., Seagate Technology, Akamai Technologies, Endo International, Dollar Tree, Zoetis and Nordstrom. On Wednesday, stocks ended the day lower. 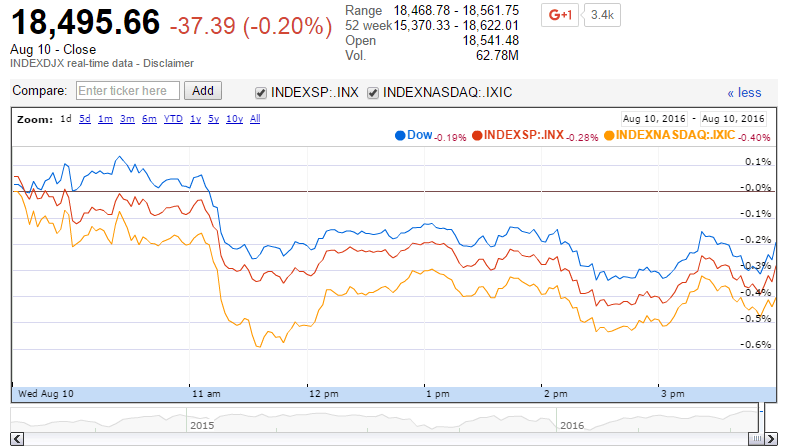 The Dow Jones Industrial Average closed at 18495.66 for a loss of -37.39 points or -0.20 percent. The S&P 500 was lower, closing at 2175.49 for a loss of -6.25 points or -0.29 percent. The Nasdaq Composite closed lower at 5204.58 for a loss of -20.90 points or -0.40 percent. Other notable index closes included the small-cap Russell 2000 Index, lower at 1223.27 for a loss of -8.47 points or -0.69 percent; the S&P 600 Small-Cap Index, lower at 742.13 for a loss of -3.73 points or -0.50 percent; the S&P 400 Mid-Cap Index, closing at 1556.98 for a loss of -5.52 points or -0.35 percent; the S&P 100 Index closing at 963.78 for a loss of -3.15 points or -0.33 percent; the Russell 3000 Index closing at 1285.13 for a loss of -4.17 points or -0.32 percent; the Russell 1000 Index closing at 1205.04 for a loss of -3.55 points or -0.29 percent; and the Dow Jones U.S. Select Dividend Index closing at 619.34 for a loss of -0.80 points or -0.13 percent.